I know what you’re thinking, and you are not wrong for thinking it. Seeing the Oregon Ducks men’s basketball team playing for a National Championship is about as fathomable as seeing a funny SNL skit with Kenan Thompson. In fact, the last time Oregon basketball played in a National Championship game was March 27, 1939 (a game they won). They played a total of three games to win that title, and they have never won more than three games in a tournament in the 77 years since then. So what on God’s green turf makes this team so different? Okay, I will let the cat out of the bag … here it is – talent. This should not come as a big surprise to those of you who have watched the Ducks play at any point during this magical season. Not only is this group the most talented crew of individual ballplayers that have ever put on an Oregon uniform, they are also the best team. There are eerily striking similarities to the 2016-2017 Ducks and the national title winning teams of the last three years. 1) The last three winners all had at least one future-NBA player on their roster. 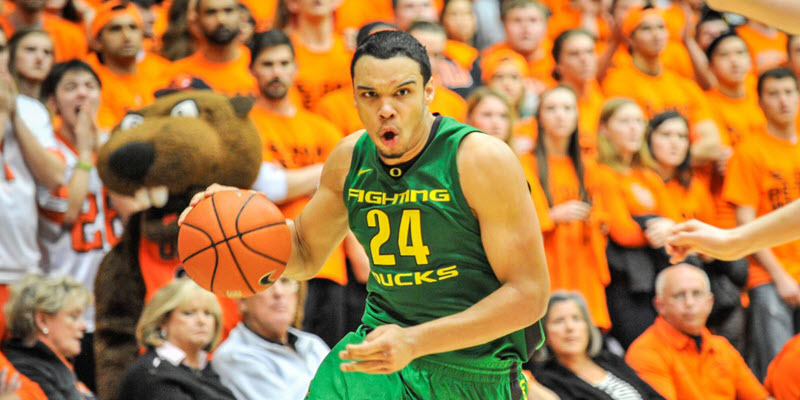 Oregon has that in Dillon Brooks, Jordan Bell, Chris Boucher, and Tyler Dorsey (take your pick). 2) All three championship teams made it to their Conference Championship game only to lose. With Arizona looking for vengeance from a humiliating loss earlier in the season to the Ducks and UCLA playing out-of-this-world right now, Oregon is most likely to experience a similar fate which will only renew their focus going into the Big Dance. 3) Each of the three previous championship winners also had length and athleticism with at least five players standing 6’6 or taller. Not only do the Ducks have size, but they also boast two of the nation’s top shot blockers and have blocked more shots than any team in the country. 4) Former National Champions Connecticut, Duke and Villanova all showed a balanced offensive attack by having four players who averaged in double figures in scoring. Oregon has five. Dana Altman ranks 11th on the list of winningest active D-1 coaches. All ten coaches ahead of him have been to final fours and six have won championships. He is due. Championship teams win close games and the Ducks have won six by 5 points or less (although many of their games have been won by 15 or more points). Altman-coached Oregon teams have shown steady improvement every year, and this year’s edition is the most electrifying and exciting to watch. They are also the deepest, most talented, and best defensive Duck team we have seen in years. Not to mention that with Dillon Brooks emerging as the stone cold killer with ice in his veins, this team is poised to make a deep tourney run and, yes, win it all.